Heavenly blog! : Nr. 400: It's not just the Holy Spirit and fire that keeps me alive, but the word of God and those who have God's revelations! Nr. 400: It's not just the Holy Spirit and fire that keeps me alive, but the word of God and those who have God's revelations! 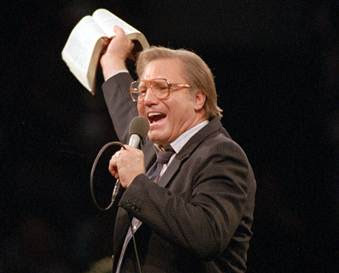 There is no one who has meant so much to me as a believer and my service as Evangelist Jimmy Swaggart about him today is not the one that I always hear the most, but I love his music and his teaching do I still very highly, highly recommend it hot! Nothing is like the word of God and personal bean instance with the living God in private! Matt. 6. 5 And when ye pray, you shall not be like the hypocrites, for they want to stand and pray in the synagogues and at the street corners, to show himself to the people, verily I say unto you, They have their reward. 6 But you, when you pray, go into your room, close the door and pray to your Father who is in secret, and thy Father which seeth in secret shall reward thee openly. God's Word transforms, edify, cheering and restored and us! When I look at many other believers I will be amazed, frustrated and overwhelmed! Why? As I see it, God's word is not to guide them in life and learning. It is very often that a building's life, service and everything on sand and not on rock because, in his life as a believer. Therefore also end their lives in failure, frustration and dropout when problems and difficulties come. And the dropout rate is really no waiver when many of the so-called renegades never had life in God. 10 "secrets" that I have Victory in my life today! 1. Cor. 11. 1. Be my imitators, as I follow after Christ! These are powerful words, but to me they allikevelle true. Follow me in life and learning and it will go well when I follow Christ. Want to come here with 10 different "sources" that I have had and that my life will bear fruit, fruit that will last. And there are no secrets or fix fakteri this question. But clear and concrete roads and trails for all believers. It worked and works for me, and I am convinced it will also do for you dear friend! 1) Longing for the Lord and the word of God to me is vitigste and greatest. Mouth Word of God is and remains invaluable. I can say that I love the word of God just as much if not more today than when I was newly saved. Can sit for hours without having to find it boring to forfype and read God's word and pray for me. This is a great privilege for all who have it so. Glory be to God and the Lamb from now and forevermore! Acts 6. 4 But we will give ourselves continually to prayer and the ministry of the Word. Greater service than this there is not. 2) God has always led me to good and edifying Christian literature and books. Here I can mention many excellent and comprehensive books that have influenced me. And having a good book in your hand is to get something from God in the spirit. We have several good books available on our website that I can highly recommended. Would also like to advices Personalities to Lewi Pethrus for those who have a calling to serve God as a minister. They will put you on track what is required and expected of you in order to serve the living God. Here he refers to include how important it is to be married and have a working spouse as a basis for a true and genuine in service to the living God. And God has not changed! 3) On our website is a lot of good and uplifting. Personally, when I take my time although I find a lot that is incredibly great edification. recommend it also to do the same. Here you will find commentaries and Bible list of all the books in the Bible. Amazingly many stories and much more. Would that the next six points to set up six different links and ways in which one can be inspired by the links we've lost the books and links.